The value of repeated action. 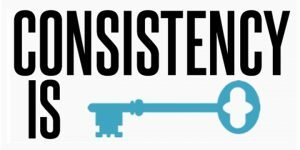 Consistency is one of the most underutilized keys to success. When you have a “never-give-up” attitude about your work and your goals, you tend to achieve daily successes and ultimately big successes. That never-give-up mindset is what consistency is really all about. I am continually amazed at what people accomplish simply by sticking to a course of action and performing the same actions over and over again! Consistent action creates consistent results. Let us use a very simple example. Suppose you have a habit of misplacing your car keys. You decide one day that this is never again going to be a problem for you because you are going to take action to always know where your car keys are. You decide that you will install a hook by the door and every single time you walk in, your keys will be hung on that hook. Now this may not sound like much, but think about the hours of frustration and wasted time you just saved! However, this system only works if you hang your keys on the hook each and every time you enter the house. If you do not do it even one time, you are on your way to inconsistent results. “Consistency is not perfection; it is simply refusing to give up,” as some anonymous, wise person said. When you refuse to stop doing the same thing over and over, you are going to get a result. If the action is negative, you will get a negative result. However, if the action moves you closer to your goal, you will eventually receive positive results. Consistency is not easy. If it was, everyone would be successful! Sometimes you have to force yourself to do things the same way over and over. However, your success will largely depend on your decision to never give up and remain consistent in all your actions. When you make that choice and take those steps, you will be amazed at how much you accomplish and how quickly your level of success rises!